Sunday: Derby Jazz presents Ripsaw Catfish! TICKETS WILL BE AVAILABLE ONLINE IN JANUARY Ripsaw Catfish is the collaborative duo of Cath Roberts (baritone saxophone) and Anton Hunter (guitar). Their music employs a collection of pre-composed elements which can then be drawn upon, or not, during the course of an improvisation. 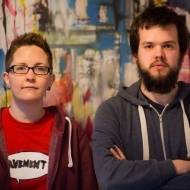 The Manchester and London-based musicians started meeting in September 2013 to explore improvised and composed music, and in 2014 they performed widely around the UK. Their debut album â€˜For The Benefit Of The Tapeâ€™ was released the same year on Raw Tonk Records, and they created ad-hoc ensembles with musicians from several cities for the touring project â€˜Shoalingâ€™, supported by Sound And Music.